I saw some blackberries on 6th Avenue yesterday, right near where I parked to go to the studio. They were poking through a chain-link fence that encloses an empty gravel lot. There were lots of berries, many of them not ripe yet. So yes, I know it’s not over, but it’s been cool and cloudy, which is bad for developing sugar in the berries. And there are a few bright red leaves on the cherry tree down the lane, the unwelcome first signs of season change. Which would all be fine except that I’m watching my mind switching to fall mode, and I don’t like it. It will be pure luck if I pick again over the weekend, and after Labour Day, finding time will be much harder than it is now. Eventually I’m going to have to pick again, or come to terms with not picking, and it’s driving me crazy. Yes, that would be the dark side of blackberry madness. At least I’ve built up a small stock of frozen berries. That means this winter I can indulge in one of my favorite cooking accidents, sorbet made in the food processor from frozen berries. A few years ago I was planning to make a raspberry sauce to go with a cold lemon soufflé. True to form, I ran out of time before dinner, so I planned to make the sauce after the main course was cleared. After all, it’s a pleasant little pause that allows the guests time to recover their appetites for dessert – so why not? The flaw in the plan? Not only had I not made the sauce, I hadn’t defrosted the berries. I popped them in the food processor anyway, with a little icing sugar and lemon juice, and, oh delight, ended up with a very nice sorbet. I’ve made it several times since then, on purpose, with frozen raspberries. Would the blackberry flavor come through? And would the seeds, which can be prominent in blackberry jam, be okay? The answers were yes, and yes. The sorbet was a triumph of blackberriness and the seeds were no problem. We were getting ready to leave for Read Island, so there was no time to fuss with a cold lemon soufflé, as nice as that would have been. But I was making chocolate chip cookies to take to Read. And there you were, available to shape and bake them. So Kris, here’s a confession. Although I sometimes tease you about your tiny-food fetish, I really liked those tiny, uniform cookies you made with the cookie scoop. And they made a great dessert with blackberry sorbet. 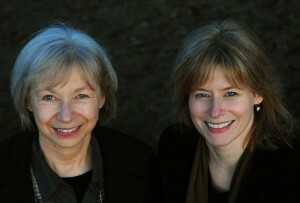 The original inspiration for the sauce was Lori Longbotham's. I've played fast and loose with quantities and method. Add berries, icing sugar and lemon juice to the work bowl of the food processor. Pulse until smooth. Serve immediately, or pack into a freezer container and keep frozen. Take the sorbet out of the freezer 20 minutes before you plan to serve it. It’s funny, the way we do family birthdays. The ones that fall outside of October, that is. Between Christmas and August it seems impossible to get us all together to celebrate individual birthdays, one each in January, March and May and two in July. We’ve tried numerous times, but our schedules don’t mesh very well. And having Bob out of town on business so frequently these days doesn’t help either. A late summer party to exchange gifts and belated birthday cards seems to work. There’s a small window of opportunity, around the third week of August, after you and Alan return from vacation and before Janet and Jenny head off in early September. By this time, there’s usually been enough warm weather and lazy summer days so we’re all relaxed, to some extent, along with more relaxed summer schedules. After spending the day in the kitchen chopping, roasting and making vinaigrettes, I was happy to enlist some help to assemble the appetizers — Alana with the smoked salmon canapes and you with the melon pieces wrapped with prosciutto. We don’t hang out too often in the kitchen together, but it’s always interesting to compare how we’d tackle things. Like the prosciutto wrapped melon. If it were you, you would have put the ingredients on a plate so your guests could assemble their own appetizers. The pieces of melon are so small, you want me to wrap each one? It’s true, making individual bites of prosciutto-wrapped melon is more labor intensive. But I like them that way. I think it’s partly because I like to be on the receiving end of perfect bite-sized canapés. It’s like you’re at a posh cocktail party, you know? It could be my Dad’s side of the family coming out in me too. I can remember his mother taking a lot of care and attention to assemble a fruit platter for a party, fussing to make sure the watermelon slices were all evenly spaced in a fan shape and fretting a little when they would slide out of order. 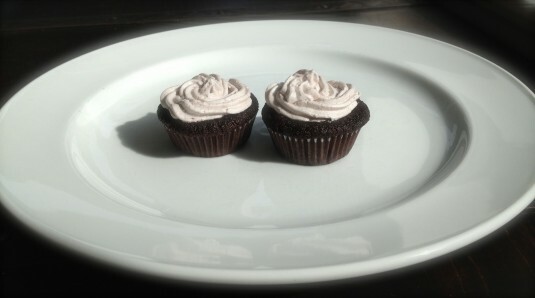 To complement your rustic peach blackberry galette for dessert, I made chocolate blackberry cupcakes. Mini sized ones. (There’s that labor intensiveness again. But they’re so cute. And bite sized!) A blackberry in the bottom of each cup, rich chocolatey cake and a Swiss meringue buttercream, lightly flavored and colored with juice from fresh blackberries that I squished through a fine mesh strainer. It was so good to get everyone together at last. We bundled up to eat outside, and I was thankful we had the outdoor heater going. When the light faded so quickly after dinner we ate dessert in the pitch black, except for the glow of the candles. 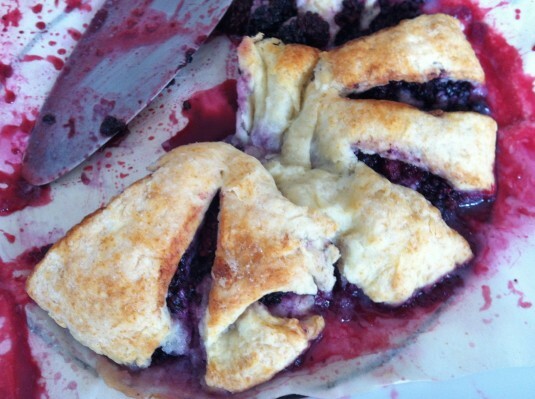 The stories, laughs and bites of blackberry galette and cupcakes made me think this is just what a late summer barbecue should be like. Happy Birthday, Bob, Eve, Jenny, Alan and Dad. Thanks to Janet, Brittne, Alana and Mike for helping make the night a special one. Adapted from Cake on the Brain's Best Ever Quinoa Cupcakes. These cupcakes are super moist, almost a bit too moist for my liking. (Hard to believe, I know.). 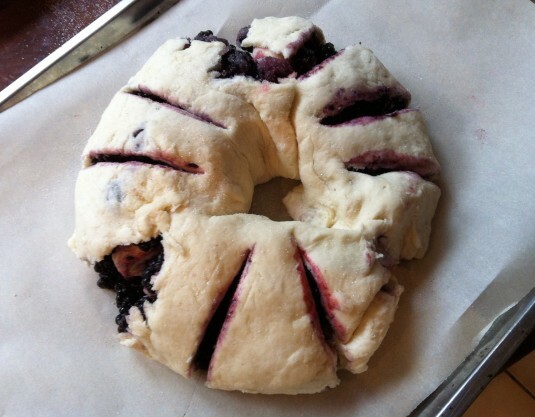 The blackberry buttercream is adapted from a recipe from Sugar for the Brain. Preheat the oven to 350F. Line a mini muffin tin with paper liners. 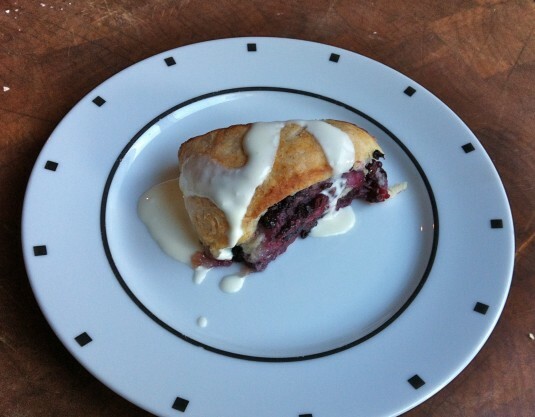 Drop 1 blackberry into each liner. In a blender or food processor, combine milk, eggs and vanilla and blend until combined. Add 2 cups of cold cooked quinoa (see below) and the melted butter. Blend until smooth. Add the sugar, cocoa, baking powder, baking soda and salt, and blend well to combine. Pour (if you're using a blender) or spoon out (if you're using a food processor) the batter into the cupcake liners. Fill them about 3/4 full. Bake the cupcakes for about 20 minutes, or until a cake tester inserted into the middle of a cupcake comes out clean. Let the cupcakes cool in the tin for 5 minutes, then remove them to a wire rack to cool completely. 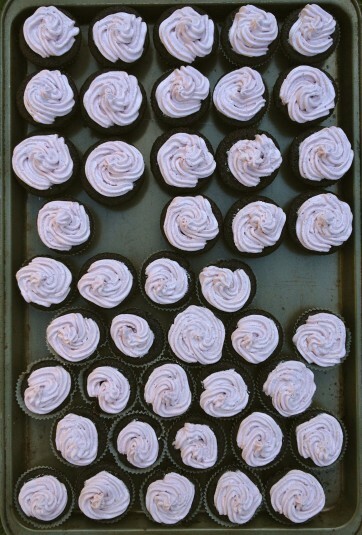 If desired, frost with blackberry buttercream. Fill a medium saucepan 1/4 to 1/3 full with water and bring to a simmer. In the bowl of a stand mixer, add the egg whites and sugar. Place the bowl on top of the saucepan and whisk constantly until the temperature reaches 160F. If you don't have a candy thermometer, whisk until the sugar has completely dissolved and the egg whites are hot. Remove the egg white and sugar mixture from the heat and quickly move it to your stand mixer. With the whisk attachment, whip until the mixture is thick, glossy and cool, about 4-5 minutes. Scrape down the sides of the bowl and remove the whisk attachment. Using the paddle attachment, beat the mixture on medium speed. While the mixture is beating, add the softened butter one piece at a time and mix until all the butter is incorporated. Add the salt. Squish the blackberries in a fine mesh strainer over a bowl to extract the juice. Add to the buttercream and blend until smooth. If you haven't got cooked quinoa on hand, make it first so it can cool before you add it to the cake batter: For 2 cups of cooked quinoa, rinse 2/3 cup raw quinoa. Place it in a heavy saucepan with 1 cup water and bring to a boil on medium-high heat. Cover, reduce heat to low and simmer for 15 minutes. Remove from heat and leave covered for another 10 minutes. Fluff with fork and allow the quinoa to cool completely. Quick Tip: If you're in a hurry, spread the cooked quinoa on a baking sheet and pop it into the fridge so it will cool faster. Two sunny weeks in a cabin on a lake, no electricity, no traffic, just loons, ravens, tree frogs, eagles, and my favorite kind of cooking: roughing it. I know you’re a five-star hotel kind of girl, not a camper. For me, cooking at the cabin is some of the happiest cooking I do all year. Truth be told, I was even more entranced with cabin cooking when the stove was a two-burner Coleman, and the only fridge was the little one we now use for keeping drinks cold. It made whatever came out of the kitchen so much more a triumph of skill over circumstances. Now, with a propane fridge and a four-burner propane stove with an oven, and this year – oh luxury – hot water on demand in the kitchen sink, it’s arguable how much roughing it is actually going on. Still, we have to bring in anything we intend to eat, or else persuade one of our land partners who’s coming in from Quadra Island to replenish the milk, eggs and bread that always disappear fastest. Sometimes the weather’s cold and I bake. This year we hit the sweet spot of summer, day after hot, sunny day, and there was no incentive to heat up the kitchen. Some years we have blackberries in profusion; this year we were about a week early. I spent a lot of time clearing out the bracken fern, salal and salmonberries on the slope where the blackberries grow, but that was contemplative, not culinary. Oddly enough, we were awash in avocados. We brought in 10 and found another five waiting in the fridge. Guacamole, cream cheese, avocado and tomato sandwiches, avocado and radish salad: it was a theme…. I have no doubt it will be a good year for blackberries. We’ve had a stretch of warm weather that’s extended out for several weeks, to the point that I almost can’t remember the last time it rained in Vancouver. Almost. 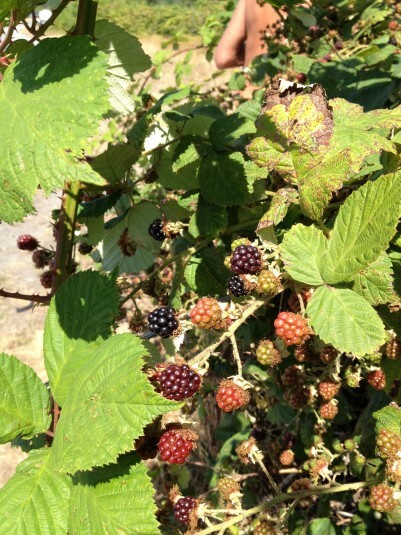 Even with all the sun and heat, though, blackberries do take their time to ripen. 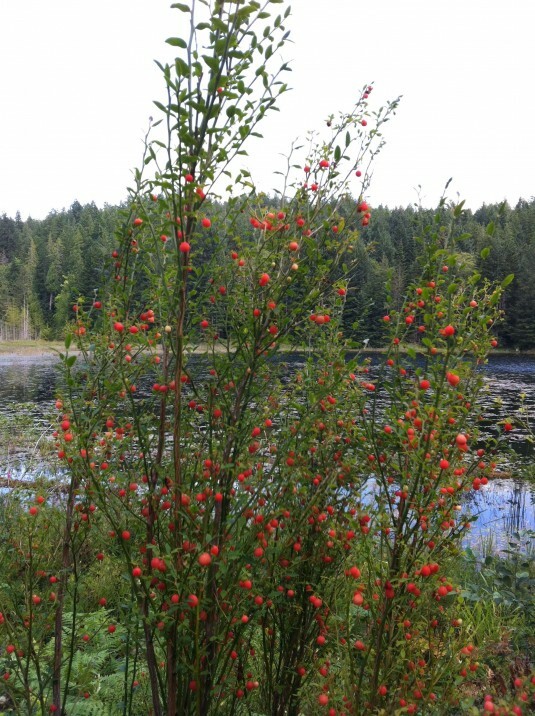 It’s mid-August already, but over the weekend the two spots that Bob scoped out for picking had bushes mostly full of hard, light red berries that won’t be ready for at least another week. There were a few juicy ones, though, the kind that practically fall off into your fingers when you give them a gentle tug. In our defense, it was a very hot afternoon. And it was our first time out this season. More of a blackberry reconnaissance mission, since we weren’t sure what state the berries would be in once we got up close. We’ll know better next time, or at least we’ll bring some long sticks to push away the prickly shoots. 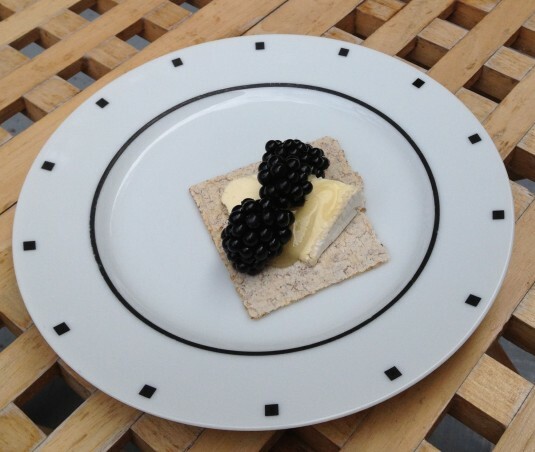 At the risk of duplicating your triple cream brie and honey dessert too closely, Eve, I experimented with an appetizer of roasted blackberries, lightly melted brie and toasted crostini. 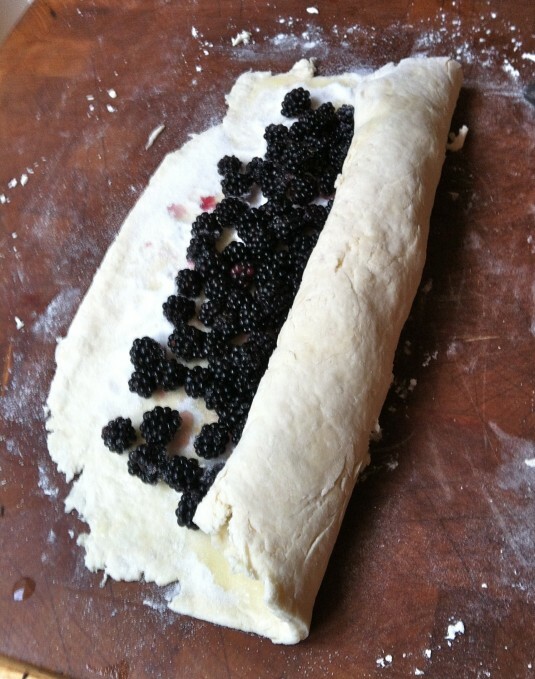 So we could have blackberries before and after dinner. It makes perfect sense in August, doesn’t it? The roasted berries have a savory twist — a splash of olive oil and some salt and pepper before you roast them. (I love a sweet-salty flavor combination. The ripe, sweet berries together with the salt were rather moreish, as Bob would say.) Aahhhh, summer. 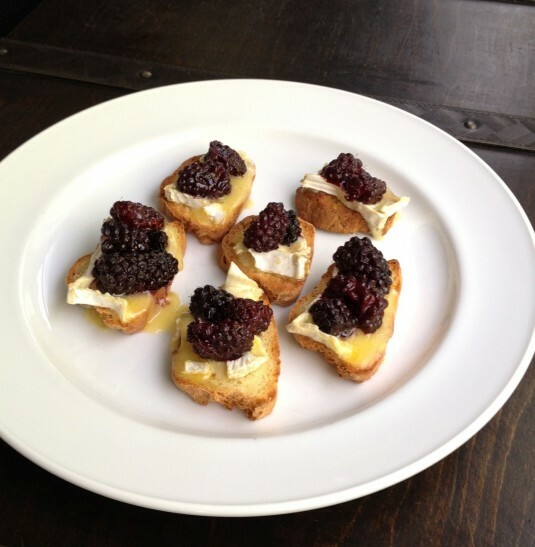 A savory twist on blackberries, this cheesy fruity crostini is a delicious start a summer evening. Even better with a glass of crisp rose wine. Slice baguette into 1/4 inch slices and place on an unlined baking sheet. Bake until tops are lightly browned, about 5-7 minutes. Turn crostini over and bake until lightly browned, another 3-4 minutes. Move crostini to a cooling rack and let cool. Set your oven to broil. Place the crostini on an unlined baking sheet. Top each with one slice of the brie and broil until the brie is slightly melted. Remove from oven. 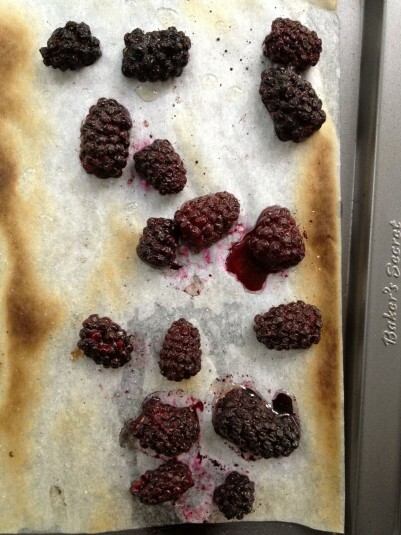 Top each crostini with 2-3 roasted blackberries and serve immediately. It’s August, and the bushes are heavy with blackberries. I find myself thinking about them a little too much, speculating on what kind of a blackberry season it will be. Will it be a good crop? Will I find a good place to pick? Will there be good weather, and lots of time for picking? Yes, blackberry madness is about to set in, the delirious state in which I attempt to use blackberries in as many ways as is humanly possible before the season ends. Last year, I have to say, was about was about as good as it gets. We spent a week at the end of August at the Captain’s Quarters on Galiano Island. It’s a combination B&B and basil farm, up near Pebble Beach. We’d never been there before, and it was a lovely shock to discover a field, bordered with blackberry bushes, just outside the cabin door. Plus, we had an open invitation to pick. Breakfast: blackberries in yogurt for me, blackberries on cereal for Al. Snacks: blackberries eaten in handfuls out of a bowl. 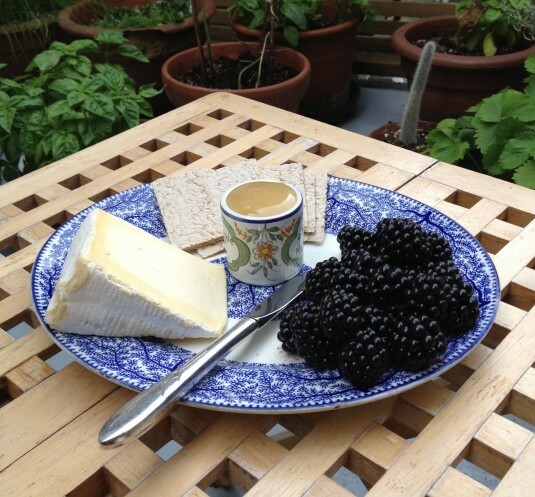 Saint Andre triple creme brie, on a thin crisp bread, drizzled with honey and topped with blackberries. If we picked the berries after supper, we could have them while they were still warm from the sun. I’m not going to try to describe it, beyond saying that it was cream-and-berry heaven, but I do plan to do it again this year, repeatedly, for as long as blackberry season lasts. 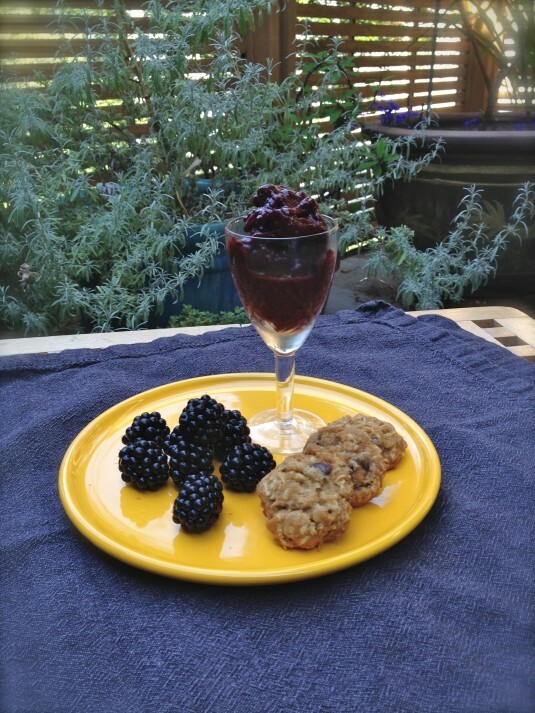 There are, in fact, a whole pile of things I want to do with blackberries this summer – lots of old favorites, and a few I’d like to try for the first time. So let’s hope it’s a good year.